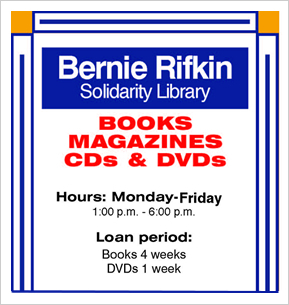 At the DC 37 Education Fund Library, popular books and DVD’s can be borrowed for up to 28 days, or use a computer unit. The library has a basic reference collection and titles on popular fiction, current events, history, women’s studies, Black or Latino studies, labor studies, biographies, computer skills, art or psychology. There are also four special collections: Harry Gray memorial Labor Collection, which is a popular selection of books on workers, unions and collective bargaining, donated by Local 372; a New York City Collection consisting of books of all types on the history, economy and culture of New York City, donated by locals and staff of DC 37 in memory of June Ringel; Paul Greene Memorial Collection, which is a selection of films (on video) and literature from the American Experience; and a Basic Skills Collection on reading and writing skills, math, HSE, and ESL. Please call us for more information or consultation at (212) 815-1641 or (212) 815-1699. To access the DC 37 Education Fund Library online catalog, click here, enter “DC 37 Library” as the library name, then click the “Sign In” button. No password is needed.